Vanderwees Home & Garden in Thunder Bay is excited to present Tulips Café. 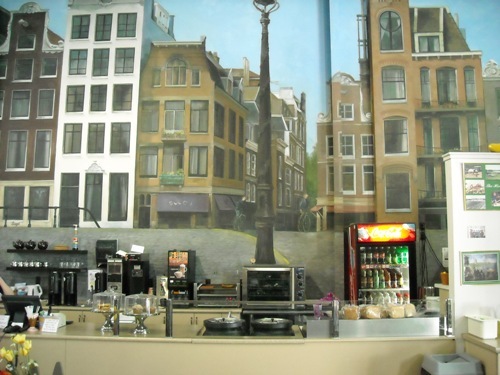 Our beautiful Café is set against three murals of unique Dutch scenes, and delightfully situated within our garden centre. Open Monday – Friday from 10am – 4pm with Lunch Served from 11am – 3pm. *Call us for special hours in January & February. Stop by for a freshly brewed morning coffee and tasty treat from the dessert case. All of our muffins and cookies are baked fresh, here in our oven. Enjoy a lunch of a sandwich, European melt, and soup or fresh garden salad. Our sandwiches and melts are made with fresh, local ingredients and a touch of European flare! Gluten Free Options Available! Please let us know if you have food allergies and we will do our best to accommodate you! Vanderwees Garden Gallery is Thunder Bay’s Garden Centre for the whole family. Visit our gift shop and greenhouses while your kids enjoy our family fun centre!